I've talked about it before, but I will mention it again: working out on a consistent basis does not come naturally for me. I so wish it did though. Instead, it's something I really have to work at and force myself to do. Don't get me wrong, I love a good work out, and I love group fitness classes, but the struggle to get from my place of comfort to doing said workout is a constant battle. Prior to getting pregnant with Sully (more than 3 years ago now), I was in pretty good shape and happy with my physical self. I was going to GoodLife Fitness regularly and surprisingly, workouts were easily a part of my routine at that point in my life. 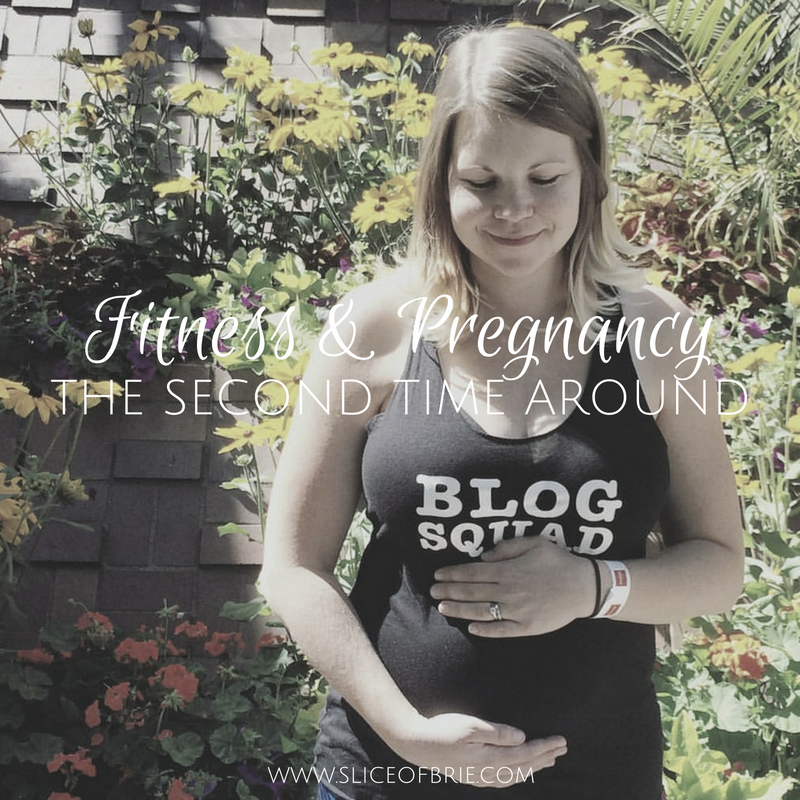 I remember always saying to myself, "when I get pregnant, I'm going to be one of those super fit pregnant mama's and I'm going to stay really active throughout my pregnancy". Then I got pregnant in May of 2013, but I didn't find out I was pregnant until almost the end of June, at 6 weeks pregnant. During that time, I was still going to the gym, and the last class I remember taking at GoodLife Fitness was a BodyStep Class. I was probably around 5 weeks pregnant at the time. The class was in the morning, I had eaten my usual pre-workout breakfast and I felt no different than usual going into it. The class was tough. I had never done a BodyStep class before (although I'm no stranger to regular step classes), and it was intense. About 3/4 of the way through, I felt terrible. I was weak, getting dizzy and seeing stars. All I wanted to do was lay down or leave, but there were only 5 of us in the class and my pride forced me to stay. Thankfully, I was able to finish the class without passing out. During this time, my in-laws were in town visiting and we were all getting ready to fly back to Nova Scotia together for a wedding, so I didn't make it back to the gym before leaving. I found out the day before we left that I was pregnant. In hindsight, I knew that was probably why I felt so different during that class. But I'm not going to lie...at the time, I was nervous to go back to a group fitness class. It was a hot and humid June/July in Nova Scotia (I was there for three weeks), and the exhaustion that comes with your first trimester hit me hard. It was a miracle if I could get through showering and blow drying my hair without passing out. Anyway, eventually I returned back home, returned to work, but what I didn't return to was working out. I was tired, the debilitating SI joint pain I experienced from early on in my pregnancy was horrible, and I really just had no motivation. I spent the rest of that pregnancy in-active except for daily walks with Saigon and Jim, but even those grew less and less as winter approached and my hip-pain grew worse. Luckily, I didn't gain very much weight during my first pregnancy, and while I lost it all initially very quickly, over the next two years, it crept back on and then some. I knew I wanted to be in better shape physically before getting pregnant a second time, but I just couldn't get to that place in time. My life is different going into this pregnancy though. My lifestyle, for one, has changed since moving to Calgary. I have a great group of friends here who keep me active, something I didn't have in Edmonton (back then it was just me and the gym). I have ran 3 races this pregnancy, have attended a two hour Yogathon, and continue to go to BodyFlow classes and GoodLife Fitness. Not to mention, I have an active toddler that keeps me on my feet and out and about. I'm not going to pretend to be someone I'm not. I don't work out everyday and for the rest of this pregnancy, I won't. I still wish I were one of those super fit pregnant mommas, but I'm not, and I'm okay with that. My first pregnancy taught me that the body is a miraculous thing, and while I might not have entered this pregnancy at a comfortable place physically speaking, I can accept that because pregnancy and getting pregnant is something I consider a miracle and I am just grateful that my body has allowed this to happen again. So going forward, I hope to continue with the activity that I have been keeping up with and I hope every day that the hip-pain I had with Sully doesn't rear its ugly head this time around. I don't think I will be running anymore until after this baby comes, but I plan to continue with classes at the gym, attend group fitness events with my friends if the occasion arises, and continue to get out for walks and bike rides with Sully while the weather still permits. Basically, organized activities outside of the house I am much more inclined to want to do! I know remaining active during your pregnancy is so important, so while I may not be busting out my 21 Day Fix workout videos anytime soon, I will strive to just keep on moving.